This is the start of another stunt spectacular series. The stunts in this series, seem to get better with each outing. 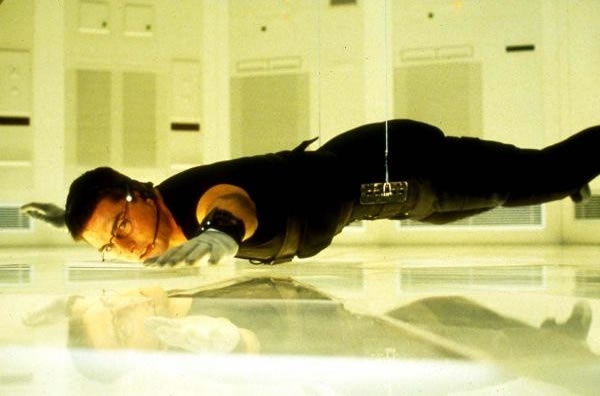 At first Tom Cruise started out doing a few of his stunts and with every movie did more and more. But he seemed particularly adept at them from the very start. 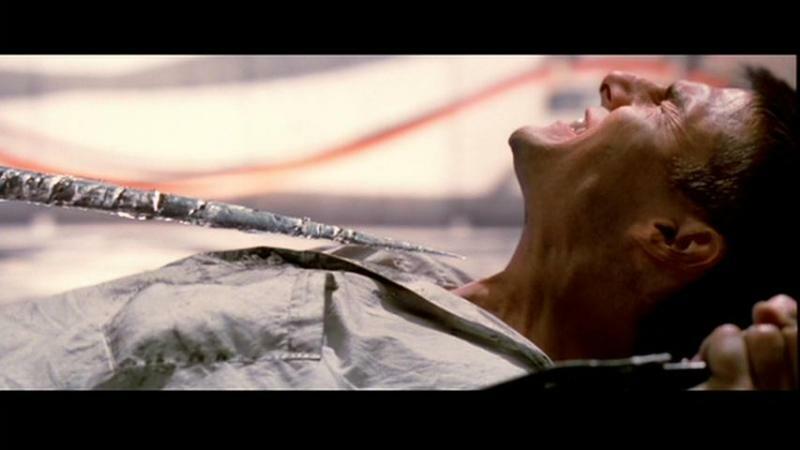 For example in the famous scene where he drops from the ceiling and hovers inches above the ground, Cruise’s head kept hitting the floor until he got the idea to put coins in his shoes for balance. He just kept doing it until he figured it out. He’s supplied the same ingenuity in every sequel since. The scene that takes place in a glass-walled restaurant with a big lobster tank in the middle and three huge fish tanks overhead was Cruise’s idea. There were 16 tons in all of the tanks and there was a concern that when they detonated, a lot of glass would fly around. De Palma tried the sequence with a stuntman, but it did not look convincing and he asked Cruise to do it, despite the possibility that the actor could have drowned. For the train sequence, Cruise wanted wind that was so powerful that it could knock him off the train. Cruise had difficulty finding the right machine that would create the wind velocity that would look visually accurate before remembering a simulator he used while training as a skydiver. The only machine of its kind in Europe was located and acquired. Cruise had it produce winds up to 140 miles per hour so it would distort his face. Most of the sequence, however, was filmed on a stage against a blue screen for later digitizing by the visual effects team at Industrial Light & Magic. 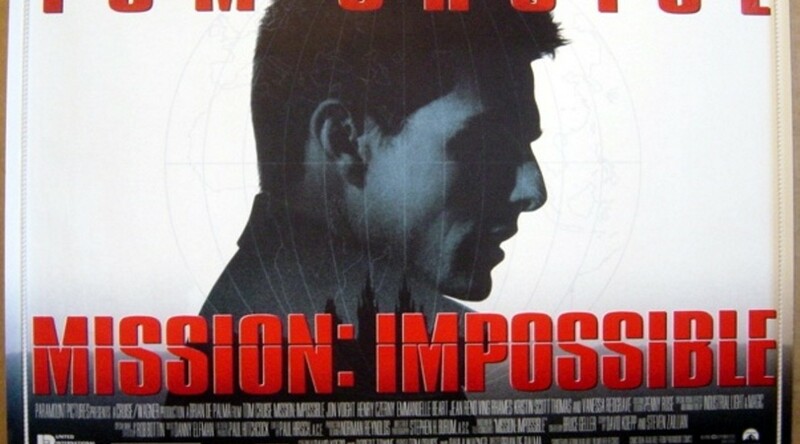 Mission Impossible was directed by Brian De Palma for Paramount Pictures. 1. Stunt Performers – A stunt performer, often referred to as a stuntman, or daredevil, is someone who performs dangerous stunts, often as a career. A stunt-man, or stunt-woman, typically performs stunts intended for use in a motion pictures or dramatized television. Stunts are sometimes rigged so that, while they look dangerous, safety mechanisms are built into the performance, however, often stunts are as dangerous as they appear to be. Stunts often seen in films and television include car crashes, falls from great height, drags (for example, behind a horse) and explosions. Film and television stunt performers are often trained in martial arts and stage combat. 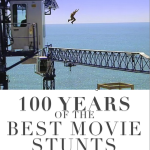 There is an inherent risk in the performance of all stunt work in film, television and stage work; the most risk exists when performing stunts in front of a live audience. In filmed performances, visible safety mechanisms can be removed by editing. In live performances the audience can better see if the performer is genuinely doing what they claim to be doing. Daredevils are distinct from stunt performers and stunt doubles; their performance is of the stunt itself, without the context of a film or television show. Daredevils often perform for an audience. Live stunt performers include escape artists, sword swallowers, glass walkers, fire eaters, trapeze artists, and many other sideshow and circus arts. They also include motorcycle display teams and the once popular Wall of Death. The Jackass films and television series are well-known and prominent recorded examples of the act in modern cinematography. Some individuals, such as Buster Keaton, Harry Houdini, Jackie Chan, Akshay Kumar, Tony Jaa, and Jayan act as both stunt performers and daredevils at various parts of their career.